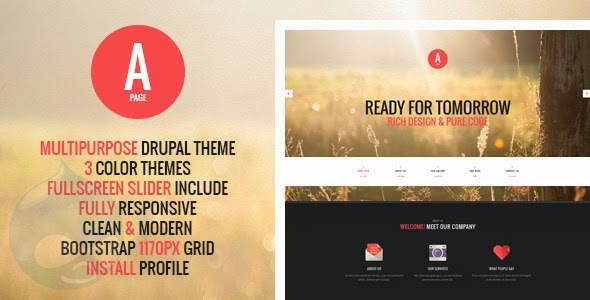 A-Page is a one page and multipage page Drupal theme with a lot of useful features. It’s front-page designed as single-page, but it also has a standard subpages. It suits for any type of portfolio, design studio, business, personal website etc. A-Page has 3 accent color themes, just check them! Slider/Image supported for Projects, Parallax parts. Item Reviewed: APage - Flat Onepage and Multipage Drupal Theme 9 out of 10 based on 10 ratings. 9 user reviews.